Back at our old house, Rupert (cat) started to pee in the tub that Nanashi used for showers. My guess is that big ol' Rupert found the covered catboxes too claustrophobic (he probably could barely turn around) and liked the wide-open-ness of the tub. It wasn't my tub, and Nanashi didn't care much since it's easy to wash down. But I thought, when we move to the new house, I'd get Rupert in a new habit. Meanwhile, Starfish (dog) decided to start eating cat poop out of the cat boxes. Both cat boxes are covered, but her needle-nose could get right in there. One box, in the spare room, I just turned to face the wall, a few inches away so the cats could still get in but Starfish couldn't. The bathroom one, we started keeping the door nearly-closed so the cats could get in, but not the dog. Any time we left the door open, Starfish would help herself. In fact, I have never caught her in the act - she's incredibly stealthy! - but then she's given away by the excited way she comes to "tell" me about it like I'd be so proud, and the cat litter on her lips, and the mess of cat litter on the floor/top of catbox/down the hall. So again, I thought, in the new house, I'll figure something out. We moved to a temporary house in between selling ours/buying a new one. There, with the one catbox in the one bathroom, Starfish found it, so I turned it to the wall (she'd sometimes push it away from the wall enough to still get some poop! ), and Rupert starting peeing and pooping in the tub. And now that it was the tub that all 3 of us used, it was even more annoying, since we had to clean the tub constantly. So, we buy the new house, and it really doesn't lend itself to catboxes. The bathrooms - one is too tiny, the other, while roomy, has a layout that doesn't lend itself very well, and is the one we mainly use so having cat litter on the floor is ... gross. But immediately, Rupert started peeing & pooping in the tub. So I instituted a keep-both-bathroom-doors-closed-always policy. I got a rubbermaid storage tub, no lid, really big, and put it in the bottom of a hall closet. This closet has an accordion door, so I used door stops to keep the door about 5 inches open. That seemed to work for everyone until Starfish noticed that she could push the door open wider. So then I used a chain to keep the door about 5" open. It wasn't a real chain - it was easily broken - and in a few days, she'd broken the chain and gotten into the poop. Nanashi thinks we need to let Rupert have access to the tub. That makes me a little sick. Really, is that my only option? If Rupert insists on wide-open space, and Starfish can access those wide-open spaces, and the only wide-open spaces are where we wouldn't want litter boxes anyway, is there really no other option? is starfish deterred by simple barriers, or do they have to be heavy duty? we are keeping maia out of the litter box bathroom by using a shower-stall-rod (the shorter ones) across the doorway, about knee-high (which is about chest-high for her). she can't walk in, and she doesn't ever try to go over or under it. we're lucky because we have 18 bathrooms in this joint, so it's not a room we have to go into much, and stepping over it is relatively easy. Hm. You shoulda considered cat box placement while you were looking at houses! I have no obvious suggestions...only outlandish ones. You can try putting a smallish litter box in a large rubbermaid container, then put a radio-frequency cat door on the rubbermaid and a collar with a magnetic key on Rupert. The door would only open for Rupert. Of course, then you would have to teach Rupert how to use a cat-door (which is where I got stuck when I tried to set up a dedicated feeding station for one kitty who is on a special diet and who I would like to be able to free-feed...'nother story entirely... (I have a magnetic cat door that you can try)). Or you could try one of those 'decorative' litterboxes that are disguised as furniture. Maybe one of those is configured in such a way that Starfish can't reach back in and snack. I would also consider getting multiple litter boxes -- Rupert is sacrificing a lot (bathtub litterbox! ), so you want to give him acceptable options compared to your carpeted floors. Too bad you don't have any lesser-used rooms (an office, maybe?) that you can dedicate to be Rupert's litterbox area, maybe with a small cat door that only he can go in and out of. Whatever you do, you really don't want poor Rupert to get used to using the rug...You're going to have to attack this problem hard and quickly. [quote="bluedawg";p=5002]is starfish deterred by simple barriers, or do they have to be heavy duty? we are keeping maia out of the litter box bathroom by using a shower-stall-rod (the shorter ones) across the doorway, about knee-high (which is about chest-high for her). she can't walk in, and she doesn't ever try to go over or under it. A bar occurred to me today as I pondered the issue, after posting. I think Starfish would be deterred by a chest-high bar; she would never go over/under. It also occurred to me that Starfish won't walk on the hardwood without rugs there, so I could pull up the rug that leads to the cat box, and just leave Flor squares going to the office off to the side. Of course, either of these only work if Rupert uses the box again. [quote="quagga";p=5003]You can try putting a smallish litter box in a large rubbermaid container, then put a radio-frequency cat door on the rubbermaid and a collar with a magnetic key on Rupert. The door would only open for Rupert. Of course, then you would have to teach Rupert how to use a cat-door. I think he could use a cat door (has in the past) but the hall closet door doesn't have room for a cat door to swing inward. [quote="quagga";p=5003]Or you could try one of those 'decorative' litterboxes that are disguised as furniture. Maybe one of those is configured in such a way that Starfish can't reach back in and snack. I would also consider getting multiple litter boxes -- Rupert is sacrificing a lot (bathtub litterbox! ), so you want to give him acceptable options compared to your carpeted floors. I'm not sure he has ever like Swheat Scoop, but because he has what-could-be-asthma (and because I got educated) I stopped using clay litter, which was what he had always used before. Maybe I can find a non-clay litter that's similar in texture. [quote="quagga";p=5003]Or you could try him on one of those automatic litterbox machines. [quote="quagga";p=5003]Too bad you don't have any lesser-used rooms (an office, maybe?) that you can dedicate to be Rupert's litterbox area, maybe with a small cat door that only he can go in and out of. I know! I know you remember that when you stayed with us there was the spare cat box in the guest room and while you as cat peoples didn't seem to mind (and even scooped the box! NOTE, VErs: quagga and mr. quagga are excellent house guests! ), it was bothersome to me (as a host) to have guests in there with the cat box, or to install a cat door on the guest room door. We otherwise don't spend a lot of time in the guest/teevee room, but we're still back to the problem of a covered/not covered box, because when we are in there watching a show (and we've just started the Buffy series with our son, so we'll be in there every night for a loooong time! ), Starfish wants to be in there with us. [quote="quagga";p=5003]Whatever you do, you really don't want poor Rupert to get used to using the rug...You're going to have to attack this problem hard and quickly. Yes! Well, for starters I've closed the door to our son's room; it's the only carpeted room. Then, just now (prompted by your urgency and bluedawg's curtain-rod idea! ), we found a small side table that fits perfectly in the closet entry (with the closet door removed), which should keep Starfish out but allow enough open air for Rupert. I'ma gonna go take a picture. If Rupert will go back to using the box, this may have solved it for us! And if not, I'll look into an automatic litterbox. 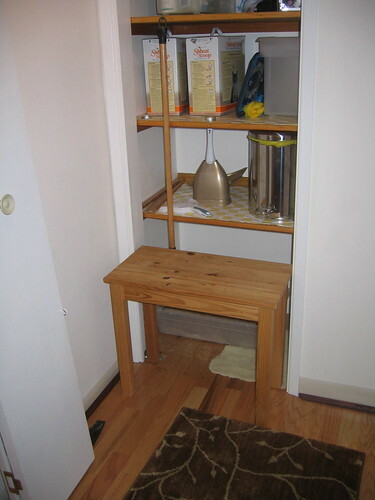 So, here you see the closet with the door removed and a small side-table blocking the entry. The table is wide enough and high/low enough that Starfish can't go over/under it, but gives a lot of room to the cats. Fingers crossed, y'all! i like it! keep us posted! Neat solution! I hope that it works. [quote="Miso Vegan";p=5010][quote="quagga";p=5003]I'm not sure he has ever like Swheat Scoop, but because he has what-could-be-asthma (and because I got educated) I stopped using clay litter, which was what he had always used before. Maybe I can find a non-clay litter that's similar in texture. You could try World's Best. It's not too dissimilar from clay litter in consistency, and it is way less dusty. It's what we use. Looks like you've got this under control now, but I have two more suggestions. 1) Put a litter box in the tub? It would have to be easy to remove and replace, of course, since you'd have to make sure it was out before anyone turned on the shower. Also, everyone would have to remember to take it out every time. Hmm. Maybe that's not a good idea after all! 2) This one is a human safety suggestion. If you put a rod at dog-chest height, you might want to spray-paint it glow-in-the-dark neon orange to keep people from falling over it! Or maybe you could put another one at the average person's eye-level so people would notice that they need to stop. Most people could easily step over the lower bar and duck under the higher one. I hope your current solution works, of course!